Hitler’s Hollywood begins not with the goose stepping and sieg heiling of Triumph of the Will, but instead with some jaunty whistling from the 1937 film Der Mann der Sherlock Holmes war. In these opening moments, Rüdiger Suchsland’s doc signals Nazi-era German cinema as an idealistic, seductive and deeply complex arm of the regime’s propaganda machine. 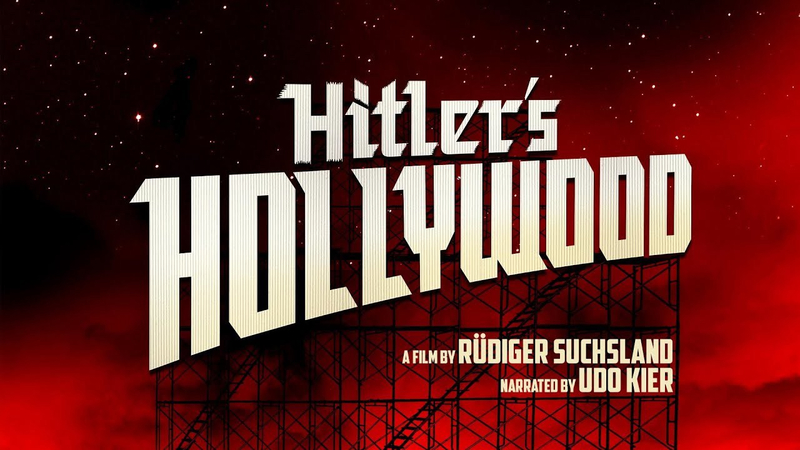 Drily narrated by Udo Kier, Hitler’s Hollywood is not a film about the rise of Nazism, nor even a linear history of the era’s cinema. Rather, it seeks to capture its spirit, interrogate its aesthetics and finally, to try to understand the insidious power of its propaganda. This is a film about how, as Susan Sontag wrote, reality being reshaped to suit the image. A running theme, prevalent in films of the early 1930s, is the fetishisation of death as transcendentally heroic. In Kier’s dry intonation, the film asks us “what kind of a nation is it that needs poets to be able to kill, and to die?” The answer eludes us, being far more complex that the immediate evils of the Nazi regime – the fascination with death, mythic nostalgia, the beatification of national might, are deeply rooted not simply in Germanic culture, but in European myth making. Indeed, Hitler’s Hollywood implies, with Nazi cinema’s superficial resemblance to Hollywood film, that the discourses that defined 1930s German cinema were already latent in European and America film culture, merely needing an uber-auteur to manipulate and bring them to the surface. That auteur was of course Joseph Goebbels, the Nazi propaganda minister. Here, Suchsland suggests that popular cinema was a key tool in the creation of a national state myth – a fascist dream factory to rival that of Hollywood. The film uses Siegfried Kracauer’s 1947 study From Caligari to Hitler: A Psychological History of the German Film as a key point of reference: “cinema is a seismograph of its time: [it] knows something that we don’t know”. This underlying knowledge, the deep magic invoked by the incantations of moving images, is at the heart of Suchsland’s film -the fantasy of Nazism is as much a “film” as the cinema it produced, birthing and sustaining itself through ideological myth. The second documentary supplied on Eureka’s disc, Suchsland’s 2014 From Caligari to Hitler: German Cinema in the Age of the Masses borrows its title from Kracauer’s study. From Caligari to Hitler is a more conventional history of cinema, and more or less limits itself to the more-familiar Weimar era cinema. Nevertheless, this supplement provides valuable context to the feature presentation, and is a worthy documentary in its own right.